Keeping your natural nails looking excellent takes work. If you don’t do the work, your nails can suffer from problems such as stains, nail biting, splitting, white marks or ridges. All of these are very serious problems which an article in the In Style magazine talks about. This can come from different sources like wearing dark color nail polish or nicotine for starters. To remedy this, use a base coat so the dark color won’t stain your nails or letting your nails soak in denture-cleaning tablets for a few minutes. If you bite your nails, not only will you nails never grow, but they will look really bad. Some tips are to carry an emery board with you so you will have a way to fix your nails without biting them. Another way is to apply a bitter-tasting nail cream, which will remind you that if you bite them, you wont like the taste. This can be caused by injury or pressure to the nail matrix. The nail matrix is the area under the cuticle where the new growth happens. Unfortunately, you can’t get rid of them but you can cover it up with a dark color. This is caused from picking and pushing at your nails. Before applying your nail polish, buff the nail surface then wipe the dust away and apply a coat of ridge filler. Brittle nails can be caused by genetics, mishandling of your nails like over filling and buffing. To strengthen your nails, you can take biotin tablets and apply hardener. Wear gloves indoors and outdoors-wear rubber gloves when doing household work and going outside especially during the winter time so you wont lose moisture. Replenish lost oil-apply lotion into your nails and cuticles after you wash your hands. Wear Polish-it works as a barrier for your nails. The polish you use should have polyester resins and use acetone-free nail polish remover. File in One Direction Only-filing back and forth is bad because this frays and weakness the nails. File your nails in one direction only for the best results. Manicure after a bath. it is best to do your manicure after you take a bath because your nails are soft. The important technique to master is know how to give yourself the perfect manicure at home. The first step is to remove your nail polish. “Dampen a cotton ball with remover and hold on the nail for a few seconds, then swipe from the cuticle to the tip.” (In Style, 2001). The second step is to file and shape your nail. “For maximum strength cut nails straight across, rounding them slightly across, and slightly at the sides.” (In Style, 2001). 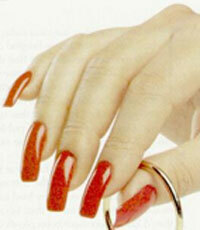 I hope that the information in this article help you with your nail care. Your nails are such an important part of your overall beauty and should not be ignored.